German government officials said the country will purchase information on secret Swiss bank accounts held by its citizens if it can do so legally, even if the move endangers relations between Berlin and Switzerland. 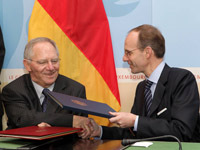 German Finance Minister Wolfgang Schauble told a news conference late Monday that the government was looking for a way to acquire the information—which the government said was offered by an informant in return for €2.5 million ($3.5 million)—without breaching privacy laws or other statutes and hopes to have a resolution soon. The information includes the account details of some 1,500 Germans allegedly hiding money from German tax authorities in Swiss bank accounts, according to people who have been briefed on the matter. After debating the proposal over the weekend, leading officials in Chancellor Angela Merkel's government decided Berlin should try to buy the data despite the potential legal and diplomatic difficulties that would ensue. Germany should do "everything to get this data…if it is relevant," to fighting tax evasion, Ms. Merkel said at a news conference. Berlin would aim to "smooth relations with the involved countries," but Germany should "aim to get possession of this data." Relations between Germany and Switzerland have never been warm, and both sides have traded insults. The small Alpine nation has long been wary of its giant northern neighbor. Berlin, in turn, accuses Switzerland of operating a tax haven that has allowed wealthy Germans to hide hundreds of billions of euros, by some estimates. Public opinion in Germany, which has some of the highest taxes in Europe, is solidly in favor of buying the information and using it to prosecute the suspected tax evaders. German authorities believe the information could help them retrieve as much as €200 million in back taxes. The Wall Street Journal has contributed to the report.